DC Thomson launches Scottish Caravans & Motorhomes, the definitive guide to touring in Scotland - D.C. Thomson & Co. Ltd. This brand new, glossy magazine shines a spotlight on the thriving caravan and motorhome scene. Every issue features live-in road tests of all the latest models and reviews of parks throughout Scotland and the North of England by respected industry insiders – plus the latest news and what’s on guides. Whether deciding which caravan or motorhome to buy, looking for the ideal park to visit or browsing for new gear to enhance the touring experience, Scottish Caravans & Motorhomes is the perfect companion for travels throughout Scotland and the North of England. Scotland’s ‘Mr Caravan’, Bob Mather, is a consultant and roving reporter for Scottish Caravans & Motorhomes, and in Issue 1 reviews a new holiday park near Fraserburgh. The Scottish Caravans & Motorhomes team will be at the Scottish Caravan, Motorhome and Holiday Home Show at the SECC, 2-5 February. Get a free copy of Scottish Caravans and Motorhomes Magazine, worth £3.95 at the show. Visit stand P450 to claim your copy (subject to availability). 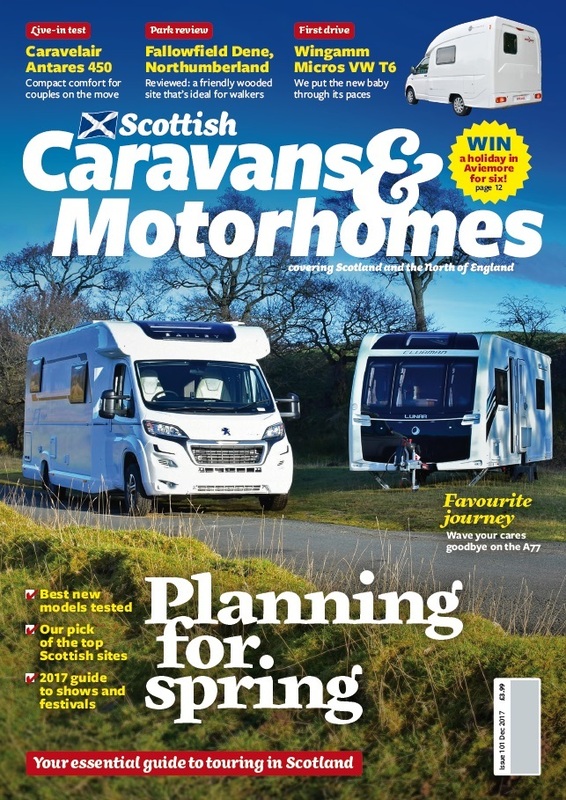 Scottish Caravans and Motorhomes is published quarterly, and available from selected holiday parks and high street retailers.